Product information "Monitoring Unit 500 DC"
Didactum`s Monitoring System 500-DC is specifically designed for the remote monitoring of energy and telecommunication infrastructure. This user friendly remote environmental and security monitoring device is equipped with an internal 24 - 48V DC power supply. The Monitoring System 500 II DC solution works as a completely stand-alone device. No additional software installation or hardware is required. Thanks to it`s full SNMPv1, SNMPv2 and SNMPv3 support, this remote monitoring device can be easily integrated into third party SNMP monitoring tools and Network Management Systems (NMS), such as Nagios, OpenNMS or Zabbix, plus many others. Required SNMP MIB files and plugins for Nagios are included. The SNMP enabled remote monitoring device 500 II DC offers you the possibility to connect analog and CAN bus sensors. Depending on your individual requirements, you can equip your environmental and security monitoring unit with a variety of sensors. Here you can choose from temperature, humidity, flooding, fire, vibration, power failure, security and air flow sensors. 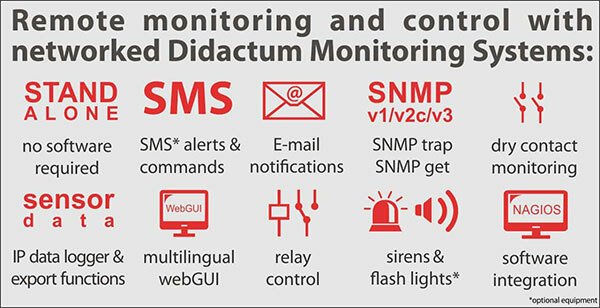 Each of Didactum`s intelligent sensors is equipped with an SNMP OID. Manufacturer Didactum also offers combined sensors. The installation of analog or digital CAN sensors is very easy. Simply connect the sensor to the corresponding sensor port of the networked remote monitoring appliance. With it`s built-in auto-identification feature, the sensor is automatically detected and displayed in Web GUI of your 500 II DC remote monitoring unit. The 500 II DC remote environmental and security monitoring solution is equipped with 4 dry contact inputs. Here you can monitor mission equipment, such as Backup Power, UPS- or HVAC- systems. Important status messages and failure alerts from your equipment can be detected in real time and forwarded to the technicians. By simply adding the external Dry Contact Unit to the 500 II DC remote monitoring device, you will receceive up to 64 additional dry contact inputs. Your IP based environmental monitoring device 500 II DC has 2 integrated 12V outputs. These outputs can be switched on and off manually, via SNMP commands, or can be automatically triggered by the sensors connected to your remote monitoring system. The optional available expansion board gives you the possibilty to switch important equipment, such as rackmount fans and cabinet cooling systems. These features provide you with new possibilities and flexibility for remote control of your critical equipment and reducing costs. Using the multilingual web interface you can preset each of your Didactum sensors individual warning threshold levels, so that you will be alerted before disaster strikes your mission critical infrastructure. This remote environmental and security monitoring device provides notification types such as e-mail, SMS (GPPRS-/GSM- modem required) and SNMP traps to third party gateways and Network Management Systems (NMS). The measured sensor data is stored in the integrated data logger of your network enabled 500 II DC monitoring device and can also be directly displayed graphically in its multilingual Web-GUI. With just a few mouse clicks you can easily create a report of the temperature profile of your telecommunication infrastructure or data center. The sensor values can be exported as an XML or CSV file directly from this IP-based remote monitoring solutions. All events and status changes are stored in the syslog and can be easily exported. On request your Didactum remote monitoring unit can be equipped with an internal GPRS- / GSM modem. The GSM modem can provide you and your colleagues with SMS alerts sent directly to your mobile phone in the event of warnings and critical conditions of your sensible infrastructure. The SMS messages can also be sent directly to the technicians, so immediate actions can take place. In case of a total loss of network communication, you can also send SMS commands directly to your Didactum environmental and security monitoring device. Each successful SMS command will be acknowledged. Related links to "Monitoring Unit 500 DC"
Delivery of this Package: Didactum 500 II DC with RJ45 cable, power cord, manual, warranty, 4 self-adhesive rubber legs, 19“ rack mounting angles. 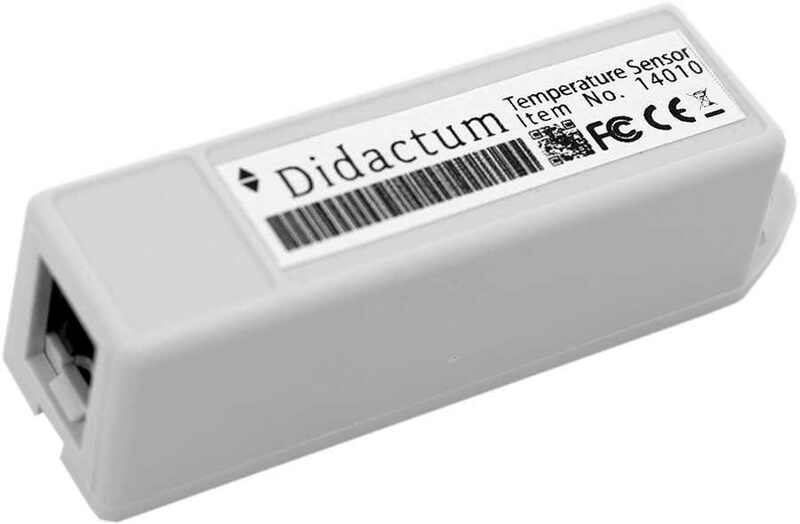 Didactum Sensor Temperature: YES, Didactum Temperature sensor for measuring and monitoring the temperature in indoor rooms. The RJ-11 cable can be used up to 100 meters away from the Didactum monitoring systems. 2m RJ-11 patch cable and mounting hardware included. Analog sensor ports: 8* ports for connection of any analog sensors from manufacturer Didactum. Maximum distance to the analog sensor - from 50 to 150 meters, depending on type of sensor. 1 x CAN Port for connection of up to 8* digital CAN sensors or 3* CAN units. Maximum CAN cable length is 305 meters (1.000 ft). Customer evaluation for "Monitoring Unit 500 DC"